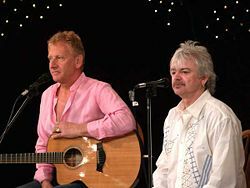 Air Supply is a pop music singing group. They formed in Melbourne, Australia in 1976. The current members are Russell Hitchcock (born June 15, 1949 in Melbourne) and Graham Russell (born June 1, 1950 in Nottingham, England). In 1981 they got with their song "The One That You Love" a number one hit in the United States. They had their most popular times during the early 1980s. This page was last changed on 5 May 2018, at 09:37.